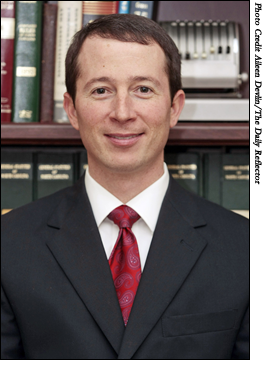 John Criscitiello focuses his legal practice on criminal defense and civil litigation. John spent over five years as an Assistant District Attorney in Pitt County where he handled thousands of felony cases in both District and Superior Court. Over thirty of his Superior Court cases were tried before a jury. In his current practice, he represents individuals charged with any criminal offense in both state and federal courts. John handles all traffic violations, alcohol related charges including DWI’s, and drug offenses. He also practices in Superior Court where he represents individuals charged with serious felonies which may result in jury trials. His experience as a former prosecutor assists clients in resolving legal problems to their satisfaction. John brings both focus and determination to each client matter and uses his knowledge of the criminal court system to advise clients on the potential range of outcomes. In addition to his criminal practice, John also represents businesses and individuals in general civil matters including federal and state court litigation, collections matters, business formations and transactions, and business disputes. John is a member of the North Carolina State Bar. He is also admitted to practice in the Federal Court system. John is a graduate of Campbell University School of Law and the University of North Carolina at Chapel Hill. He grew up in Plymouth, NC and is a graduate of Plymouth High School. In his leisure, John enjoys hunting and fishing. John Criscitiello, pronounced Cris—c—t—ello is often referred to as ‘John C’.